Are You Pitching a Softball that Follow the Fundamental Way? The windmill method is commonly employed in fast pitch softball. It is known as underhand pitch in which the arm of the pitcher starts in front and swing back to complete a full circle before releasing the ball at hip level. This method is more on arm motion, yet the pitcher should do a long stride and generate power form the torso and legs. To ensure efficiency in performing the windmill, the pitcher should understand the proper shifting of weight and speed. All the movements should be in sync to achieve maximum accuracy and velocity. Hitting the ball successfully depends on how the player does the swings. It is a daunting task to step into a box and hit a moving ball. Batters should have good reflexes, vision, strength and timing. The ball is faster than the eyes, thus a batter should know the proper mechanics of swinging the bat. Likewise, to effectively hit the ball, these three components should be in sync including the upper body, lower body and course the mechanics of swing. Over the years and through the advent of technology, the baseball and softball bats have significantly changed particularly the design. Previous designs of bats were made from aluminum, but today most bats are made with composite materials. Likewise, there are regulations set on which bats to use for each level. 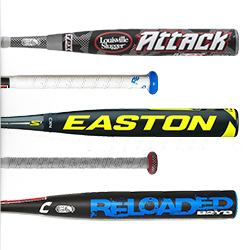 These changes have made buying softball or baseball bats overwhelming. Thus, it is important to follow some guides on how to buy bats considering important details like types of bats, length and weight of bats suitable to the size of the user. 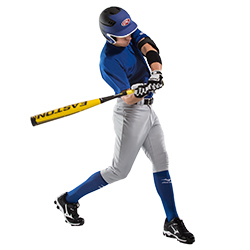 Barrel Size – Longer barrel has larger sweet spot that is ideal in making effective hits. Bats with smaller barrel is lightweight thus increases the swing speed. Big barrel bats are used for travel and Pony leagues. Grip – The grip refers to the covering on the handle of the bat that is sometimes wrapped with cloth or rubber. To ensure more reinforced grip, you can choose a bat that has leather covering. The rubber covering is perfect in reducing the sting as the player strikes the ball. 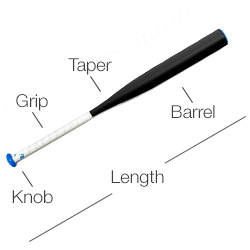 Bat Taper – The diameter of the handle of a bat is called taper. If the diameter of the taper is larger it adds weight while reducing the ball shock. On the contrary, smaller taper reduces weight and allows quick wrist rotation. In choosing the right weight and length you need to understand how it is measured. The weight is determined according to the drop weight that is the difference between the weight and length of the bat. Weight – The weight of the bat is gauged in ounces. If you want to make more power in hitting the ball, you should use heavier bats. For faster swing speeds you can use lightweight bats. Length – Obviously, longer bats offer greater reach in which it can connect with pitches. However, the added weight lessens the power and the swing speed. Drop – It is used in determining the measurement of the bat’s weight and length. Picking the proper balance between the weight and length is important in making a perfect swing. Using lightweight, long bat enables the player to make swift swing, yet it does not increase the inertia. The inertia increases if the player will use short heavy bats. Choosing the type of bats is confusing as you need to consider the materials used in designing the bat. Professionals usually use the wooden bats specifically during practice and tournaments. 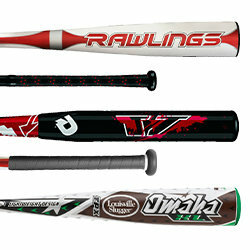 Other types of bats to choose from are made from aluminum or alloy and the composite bats. It offers greater rebound and power due to its double-layer construction. Made from different types of alloy that varies according to the weight and strength. Aluminum bat does not require break-in period. Lighter than alloy bats and offers increasing power and swing speed. Composite bats have the best balance and largest sweet spot than other types of bats. Requires break-in period, yet the performance is not compromised rather improves over time. It is not recommended to be used during cold weather; otherwise the performance can be compromised. 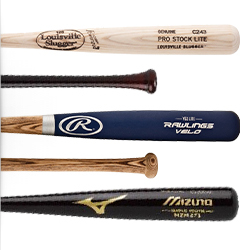 Wooden bats offer more selection in taper and shape that suits to the player’s swing. Great for training in achieving proper swing technique. Wood bats are not used in softball. It tends to break, less hitting power and smaller sweet spot. This type of bats is used by baseball players in college level and high school level. This standard level of baseball bat ensures uniform performance as compared to metal baseball bats. Knowing the important details regarding a softball or baseball bat can help in finding the best bat that you are comfortable to use. Hitting the ball depends on how comfortable the player to handle the bat in order to make a perfect hit, thus a homerun. Baseball is America’s favorite pastime and having the right type of equipment helps players to perform at their best. Good equipment also helps players to develop their fundamentals. Here is a look at the top 10 best baseball bats for 2016 that you and your team can use to perfect your skills and get the big hits that you have been training for during the off season. 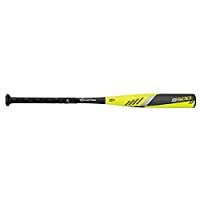 The Easton S500 is one of the best baseball bat’s on the market for kids. This bat is made from an aircraft alloy and is light to the touch. It is designed for a quick swing speed and has a great grip. A batter can perform a wide variety of batting maneuvers with this unit. They can bunt, make base hits, perform contact or pull hits with the Easton S500. The bat comes in the colors gray/yellow or yellow. This bat has a 29/32” handle and a 21/4” barrel. The unit is 28” long and it weighs 15oz or about a pound. When a baseball player grips the Easton S50 they will be getting a superior batting product that is easy to manipulate and practical to use. As a part of Brigade’s series the bat was made with a light barrel that is easy to swing and hold. The bat is evenly balanced and its design allows players to efficiently hit the ball without exerting a lot of force and momentum. The tapered handle has a cushioned grip that adds comfort and control. Players can swing this bat at a rapid pace since it is like an extension of their body. This bat is specifically designed for young and beginning hitters. The bat is sold in a red color though some other hues are available. 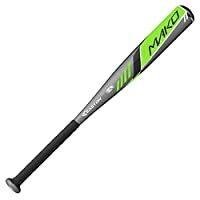 Easton’s MAKO is easy to swing and it is bat that hitter needs to possess when they are trying to get a base hit or make a home run. The aluminum core is durable and solid for young hitters trying to knock balls out of the park. This bat has a grip that allows inexperienced players to get the most out of their game. The bat is 24” long and weighs about pound. This bat is sold in the dual colors black and green. The era of wooden bats have come to an end. While companies still make these older style of bats they use modern materials for the newer styles. The Easton S300 is a part of the Speed Brigade Series which means that this bat was manufactured for quick hits and pop fly’s. A player can does not have to struggle trying to keep this bat up and level. The bat is made out of an aircraft alloy and durable and rugged for continual usage. The S300 is sold in the colors blue and black and alternate colors are available. Louisville Slugger is a name that is often associated with baseball. The Louisville Slugger series of bats have been in use for years. These particular hitting shafts have a vibration dampening end cap that is designed to contain the force inside of a bat for greater hitting power. The YBAR152 is made out of aluminum as is designed for big hits. The Slugger YBAR152 is available in many colors but is primarily sold in green and gray. 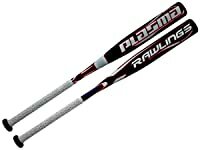 Rawlings has the YBLA4 Plasma Youth bat has a 2 ¼ inch barrel and is made for young hitters. The bat is sold in the colors silver and black and is made out of an Aerospace Plasma Alloy. It weighs in at about 1 pound and is 28” long. The unit is easy to manipulate and players can control it without having to struggle to get a hit. The balanced grip makes it comfortable to hold and people can transfer their swing power effectively throughout the unit. The Marucci Cat BBCOR Baseball Bat is a part of the Marucci series of bats that uses anti-vibration technology to stabilize the shaft. If a batter misses a pitch or hits a foul this bat will reduce the after shock form the momentum that was generated. It will also dampen hits that bounce off of the bat. The Marucci is all about forces shock absorption and the bat does this well. This unit also has an extended barrel that is perfect for hitting and energy transfer. The Cat 6 has a ring free barrel and a one-piece alloy construction. 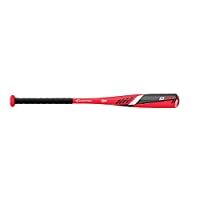 The color for this bat is white with red and gray trim. 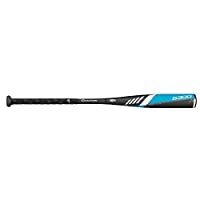 The DeMarini 2015 CF7 Youth Big Barrel (2 5/8-Inch) Baseball Bat is a light swing hitting shaft with a composite barrel. The composite barrel is not only light it is also longer which means that a player has a large sweet spot for hitting home runs. The best part of this bat is that it absorbs the energy and forces from contact with a ball to make powerful hits. Once the ball is hit away from the bat it will soar through the air with concentrated energy. Hitters of all ages and sizes will be able to make bigger hits and execute a wide variety of hitting tactics. This unit has a D-Fusion handle that gets rid of vibration. The manufacturers have flamed sealed the handled to the barrel to help reduce vibration. This bat is so advanced that it should be used exclusively for the pros. It comes in the colors silver with blue trim or sliver with orange highlights. Wood is a substance that is no longer used all that much for baseball bats. However, some companies such as Mizuno still makes their bats out of this material. The Mizuna 2014 bat is one example of a finely crafted baseball bat for the modern era. 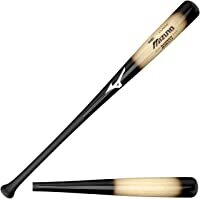 It has a classic wood base finish and is relatively light to the touch for a baseball bat. A person will not have to struggle to pick it up and swing it to make a hit. It has a sanded grip and a smooth finish. This bat is designed as a training bat to help players to develop their hitting skills. The Mizuna Bamboo Wood Bat in a dark brown color with white trim. Some of the other models are blue or black with classic wood highlights. When it is time to go to war on the baseball field, you need to call out the heavy artillery. 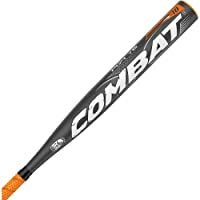 The Combat PG4YB110 is the type of armament that is needed for big hits. This bat is designed for easy hitting because it has an extended hitting surface. This will increase a player’s ability to make contact with a ball. The unit has a big barrel and a wide sweet spot for knocking the ball into the stands. While the bat is big and imposing it is fairly light for its size. It weighs in at about a pound and half. It has a seamless construction from the end grip to the knob. This seamless design does not create any weak spots on the shaft. 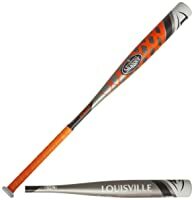 This bat is sold in the colors orange and black but other colors are available as well. There are four basic types of materials that are used for bats. These four materials are wood, composite, alloy and aluminum. Wooden bats are the only type that is used for major league play. The reason why wooden bats are used exclusively for baseball has to do with the players ability to hit the ball. Aluminum and alloy bats have a trampoline like effect that would give a player more power and a greater range with hits. Wooden bats do not provide this type of advantage. Players that use a wooden bat will have to use their own energy, strength, power and skill to make home runs, big hits or simple hits into the outfield. Major league rules require all wooden bats to be made out of a continuous piece of solid wood. Alloy and aluminum bats are more frequently used in collegiate and little league games. These type of bats gives players extra hitting power because of their design. They are traditionally lighter than the heavier wooden bats and people can make bigger hits and plays by using them. However, if a person is serious about their baseball training beyond the little leagues they will eventually have to start training with MLB styled wooden bats. Keep in mind that alloy and aluminum shafts are also good for practice bats. This is especially true for younger players. Many younger players might not be physically strong enough to hold and properly swing a heavier wooden bat with ease. The lighter weighted aluminum and alloy bats can be used to develop their fundamentals before moving them on to the heavier wooden styled bats. Composite bats are a like a cross between the wooden and metal styled bats. They are made from two different types of materials that are usually graphite and carbon. 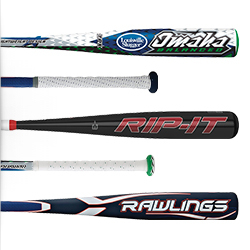 The bats are designed to provide batters with hitting power but they have durability issues. These bats are not good in cold weather conditions and they often do not stand up against repeated use. The material breaks over time and once it is worn out; the bat must be discarded. Composite bats are great for pick up games of baseball or for local league games. However, they are not suited for minor or major league play. Aluminum and alloy bats are perfect for kids who are first learning the game. They are also suited for inexperienced players that are developing their skills. Lighter bats can help a person to work on their batting stance and their swing. A heavier wooden bat could be used for this purpose but it will take players some time to learn how to properly handle them. The biggest drawback to the metal bats are the fact that they are hallow and they produce a stinging effect on a person’s hands. This is one reason why the top brand of metal bats have shock damper technology. The damping technology helps to remove the sting out of the swing or contact. Manufacturers can eliminate the sting out of hollow metal bats by making them solid. However, they would be too heavy to swing and control. Metal base bats work best when they have a hallow inside and the sting is just a fact of how they have been produced. Some metal based based have a tendency to receive dings and even dents. This usually happens over time but that does not mean that he bats do not last. The average life a metal bat is about 500 hits; some more and some less. Once a metal bat reaches this point it must be replaced otherwise it will lose its maximum exit speed velocity. The average life span of a metal bat in terms of time is no more than two summers or 6 months. If a players uses them frequently then only expect 3 months of play out of them before they start to wear. Wooden bats can last for about two summers under normal conditions. Once again a person will have to take care of them to keep them functional. An individiual can care for their bat by wiping them with alcohol after use, keeping them out of extreme temperatures and by rubbing out any dents or dings. A person should store their bat with the handle end facing up. However, if a person frequently uses their bat, they should not expect to have them a long time. Most brands are great for game play and practice.